When Tuan was a child, he used to pick up discarded motorcycle parts and try to reassemble them into something new. Little did he know at the time, but he was developing the skills that would lead him to become one of the founding partners of Design Fugitives. Tuan, who attended the UW-Milwaukee School of Architecture and Urban Planning for both undergrad and graduate school, was conducting research for his thesis on a new approach to design computation when he had the realization that he wanted to focus his energy and creativity on design and fabrication. It was at UWM-SARUP where he met other like-minded architecture students who came together to found Design Fugitives. Originally from a small town in Viet Nam, Tan Phu in the Dong Nai Province, Tuan and his family immigrated to “the frozen tundra” of Wisconsin when he was eleven years old. It’s safe to say that Milwaukee has grown on him since then, citing the city as “physically small, but rich in many other aspects such as culture, affordability, and opportunities.” Although, if he could travel anywhere, it would be back to Viet Nam to visit places that, despite being born there, he still hasn’t seen. The restaurants in Milwaukee have also grown on him, listing Pastiche, El Cabrito, Pho Cali, and Classic Slice as some of his go-to eateries. He also regularly patronizes businesses in Design Fugitives’ neighborhood – Historic Walker’s Point – recommending Anodyne Coffee Roasters, the espresso ice cream from Purple Door Ice Cream, and rounding out the day with free pizza with a side of Art’s always-entertaining stories at Just Arts Saloon. When he’s not out frequenting local Milwaukee restaurants, Tuan is either playing with his adorable 18-month-old daughter, Aimi, watching YouTube videos of robots (who doesn’t love robots?! ), perfecting his steak-grilling skills, or wasting time binge watching Netflix (specifically, “Better Call Saul” and “Fargo” right now). 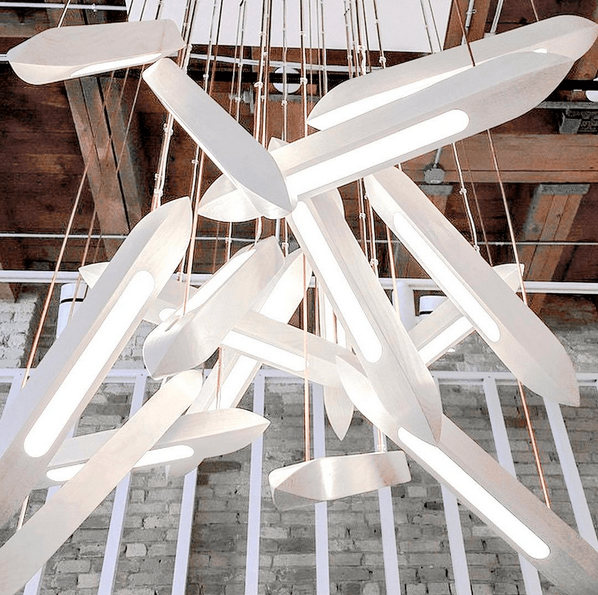 As a founding member of Design Fugitives, Tuan as worked on a lot of projects, but his favorite is the Shuttles Dance Light Fixture that was designed for Kit and Ace.The scale of the project was small, yet it had a lot of space for experimentation in regards to concept, form, and materials. The process and execution of this project were, in Tuan’s opinion, an embodiment of Design Fugitives’ M.O. Check out the fixture yourself by heading into Kit and Ace in Milwaukee’s Historic Third Ward on North Broadway. Although Design Fugitives has only executed one project with glass, the Sanctuary Lamp at Jesuit Retreat House, Tuan chose glass as his favorite medium to work with due to its great physical and experiential potentials. Glass can be transparent, translucent, or reflective. It can be spatial, or an object, or a sculpture. It’s a medium that is strong, yet fragile. Hopefully we can look forward to more glass in Tuan and Design Fugitives’ futures!